Unfortunately, Analysis Services is absolutely full of jargon. This page summarises some terms to start us off. Dimension A cube has one or more dimensions: here there are two, since we are showing the number of Oscars by studio and director. Measure A measure is any statistic being reported (here the number of films for each combination of dimension). Measure group Where there are two or more statistics, these form a measure group. For example, if we were reporting the total number of Oscar nominations and the total number of Oscars won for each film, these two measures would form a measure group. 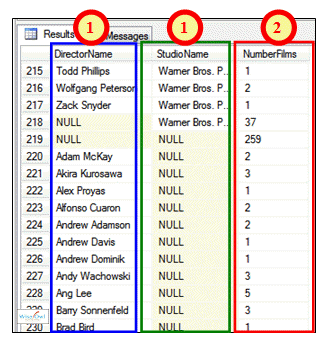 Fact table A fact table is a table which isnâ€™t being used as a dimension: here the tblFilm table containing the Oscars data is a fact table. If you want to read on, the next tutorial in this series is on Visual Studio and Business Intelligence Development Studio.